Today I am going to try something almost impossible and that is to name only twelve of my favorite castles in Wales. I will list six today and six tomorrow. Wales has more castle per square mile than anywhere else in the British Isles. I cannot conceive of a list that does not include Edwards I's mighty four. Nor can I think of leaving out the fairytale castle designed for the Marquess of Bute. Then there are the castles that are not just castles but also stately homes like Chirk. This listing is in no particular order and is not a full list of my favorite castles. I am only listing castles and no other historic sites. I will start in the North with the mighty four - Harlech, Conwy, Caernarfon and Beaumaris. Even after seven hundred years, Harlech's might and defensive stength are still evident. As it is situated almost in the center of town, every time I am there I think what it must be like to have a castle in your backyard as many towns folk do! The castle is designed on a concentric plan with a small but powerful inner ward dominated by an impressive twin-towered gatehouse and four round corner towers. Designed by Master James of St. George, the castle combines a marvellous sense of majesty with great beauty of line and form and was part of King Edward I's second campaign of castle bulding in North Wales. It was part of a ring of castles stretching from Aberystwyth around to Flint insuring Edward there would be no resitance to his rule. The views from the top of the castle are breathtaking. The castle is owned by Welsh Historic Trust and is open to the public. Next of the mighty four is Conwy Castle, also designed by Master James of St. George and part of Edwards ring of castles. The castle is built on a rocky outcrop controlling the crossing of the river Conwy and has been called "one of the greatest fortresses of medieval Europe." It is easily as impressive as Harlech but unlike Harlech, Conwy Castle and town are surrounded by a well-preserved wall lending an additional sense of strength to the site. The eight great towers and connecting walls are all intact, forming a rectangle as opposed to the concentric layouts of Edward's other castles in Wales. The castle is well preserved and offers spectacular views of the town, surrounding coastline and countryside. The castle is owned by Welsh Historic Trust and is open to the public. Our third of Edwards mighty four is Caernarfon which is architecturally one of the most impressive of all of the castles in Wales although its defensive capabilities were not as overt as the other three. The castle was designed to echo the walls of Constantinople, the imperial power of Rome and the dream castle of Welsh myth and legend. After all these years Caernarfon's immense strength remains unchanged. Edward intended this castle to be a royal residence and seat of government for North Wales. The castle's symbolic status was emphasized when Edward made sure that his son, the first English Prince of Wales, was born here in 1284. In 1969, the castle gained worldwide fame as the setting for the investiture of Prince Charles as Prince of Wales. The castle is owned by Welsh Historic Trust and is open to the public. The fourth of the mighty four, Beaumaris, was begun in 1295 and was the last and largest of the castles to be built by Edward I in Wales. Regarded by many as the finest of all the great Edwardian castles in Wales, the brilliant Master James of St George brought all his experience and inspiration to bear when building this castle, the biggest and most ambitious venture he ever undertook. In pure architectural terms, it is the most technically perfect castle in Britain. The castle has a perfectly symmetrical concentric 'walls within walls' design, involving no less than four successive lines of fortifications. The castle is owned by Welsh Historic Trust and open to the public. My fifth castle is the mighty castle of Pembroke in the southwest. Spectacularly set on the banks of the river estuary, this mighty fortress is largely intact. With its endless passages, tunnels and stairways the castle is great fun to explore. Once the seat of a succession of major barons who played leading roles in shaping Britain's history, this historic showpiece is the birthplace of Henry Tudor, father to the infamous Henry VIII and grandfather of Elizabeth I. The fine series of round towers and the remarkable gatehouse made the defences of the outer ward almost impregnable. The main gatehouse, with its two portcullises, stout doors, three machicolations in the vaulting and its series of arrowslits, is one of the finest and earliest of its kind. The castle is owned by Welsh Historic Trust and is open to the public. The sixth castle for today is in the southwest. 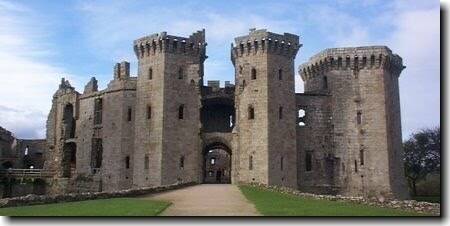 Raglan Castle, with its great multi-angular towers and Tudor styling, is unlike any other castle in Wales. The main stone used in construction of the castle is a pale, almost yellowish sandstone from Redbrook on the Wye river. The other sandstone is local Old Red Sandstone which is red, brown or purplish in color and used in the Tudor work. From a distance, Raglan seemed to have a reddish cast, although on approaching the gatehouse, the castle's yellow sandstone becomes obvious. Raglan Castle is one of the last true castles ever to be built in Wales. Construction of the castle began in the 1430s by Sir William ap Thomas. William was a Welsh knight and was responsible for building the Great Tower at Raglan, which became known as the Yellow Tower of Gwent. The castle is owned by Welsh Historic Trust and is open to the public. Tomorrows list will include castles of less might with their primary function being comfort rather than defense although some of them were built with defense in mind as well.